Who would have thought that diaper changing could be so fun? Our quilted diaper changing pads feature adorable little lion faces with colorful tags and the baby’s name and initial beautifully embroidered on them, combining fun and functional. Completely made in America, these premium cotton changing pads provide a soft, cushioned, quilted surface for comfy diaper changes at home or on the go. Babies just love to rub the colored tags, providing a built-in tactile distraction so Mom and Dad can quickly take care of the changing business at hand. 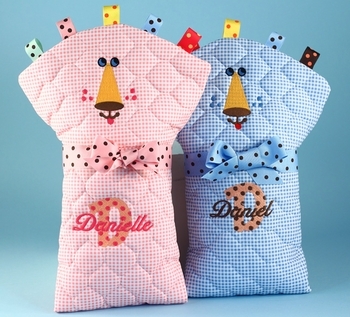 Available in blue or pink, each pad measures a generous 18 by 25 inches and is easily machine washable. Attractively wrapped in a clear cello bag and ships free. Processing Time Allow 3-4 business days for personalization. Does not include shipping time.